It’s 11:00 am on a weekday (and workday) morning and I’m sitting with what looks like a Guiness draft in front of me. What’s going on? At Dog Days Cafe in Onset, Lexie just poured me a glass of nitro brew, the newest coffee trend and it may be the best so far. It’s cold brew coffee, poured straight from a keg and, although Lexie swears there’s nothing but coffee in it, it looks suspiciously creamy. Nitro brew is coffee with nitrogen gas percolated into it. Its resemblance to Guiness Stout is no surprise. Many light beers use carbon dioxide for the fizz, but Irish brewers have long been adding nitrogen gas to the darker stouts and ales, creating a smoother, thicker taste. It was only a matter of time before hipster coffeemakers decided to try it. Though it’s unclear where the trend started (some say in Portland, Oregon, others say Austin, Texas or Astoria, New York), it’s made its way to the South Coast. Scientists are trying to figure out why it tastes better (I love the headline in the otherwise pretty staid Chemical & Engineering News: What’s nitro cold brew, and why is it so damn delicious?). But if you’re more a humanities major, don’t worry about it and just try it. 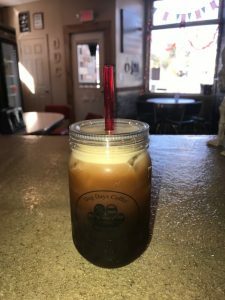 At Dog Days, they start with kegs of their cold-brew which have been saturated with their signature Scandinavian coffee beans for 72 hours. Lexi pours a glass from a tap that combines the cold-brew with a canister of nitrogen which sits besides the keg. She’s right. It tastes smooth and creamy, delicious. Lots of people! 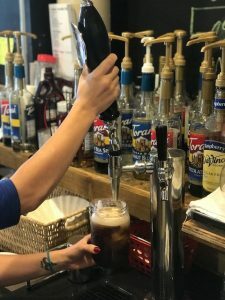 At Dog Days, it’s outselling cold brew by almost 4 to 1. Many people are willing to go with the higher price tag ($5 for a small) because it tastes so smooth (and maybe because it delivers more of a caffeine kick). People on the night shift love it. Lexie says that police officers swear by it. They come in before their 16 hour shifts to buy growlers filled with the stuff. Where can you find nitro brew? Dog Days Coffee, obviously. 2W West Central Avenue, Onset, (508) 295-2328. Cup2Cafe, 3175 Cranberry Highway, East Wareham, (508) 743-0410. Onset Bay Cafe, 1B West Central Avenue, Onset, (508) 273-0178. 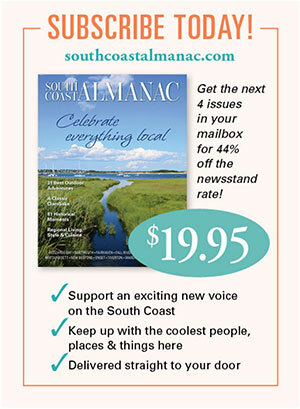 Simmons Cafe & Market, 78 Crandall Road, Little Compton, (401) 635-2420. Flour Girls Bakery, 230 Huttleston Avenue, Fairhaven, (774) 202-5884. Charred Oak Tavern, 57 Center Street, Middleboro, (508) 923-9034 (note: for diners only, Charred Oak Tavern does not serve coffee for takeout). To keep up with this and other trends on the South Coast, sign up here for updates on what we’re up to…And shoot us an email at [email protected] if you have suggestions for us. This entry was posted in Food, Uncategorized and tagged in caffeine, coffee trends, cold brew, nitro brew. « Trick-or-Treat: The Best Neighborhoods & Traditions!